Our gypsy clothing and accessories category includes a great series of items that give a sense of the freedom that is typically attributed to the gypsy way of life and convey the elegant style that these groupings of people are accredited with having worn. Featured here is a wide variety of gypsy costumes and gypsy apparel suitable for theatrical productions, daily wearing, or the Renaissance fair. Many pieces of the bohemian clothing show off bright colors, beading, and loose fits suitable for dancing or performing. All manner of gypsy accessories can be found here, as well, for adding the perfect finishing touch to your ensemble. Do not have the time, the patience, or the desire to create your own gypsy-styled hair? 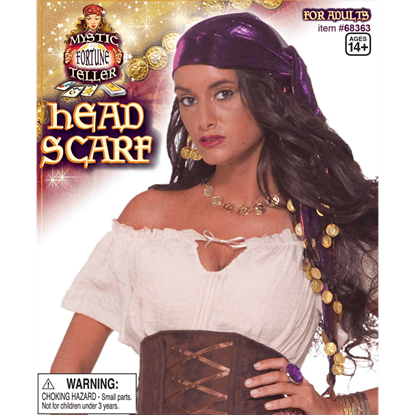 Well, never you fear, because this Black Gypsy Wig with Sequin Scarf will give you a head covered in curly black hair accented by a head scarf. This lovely fairy is all done up to attend a masquerade ball. 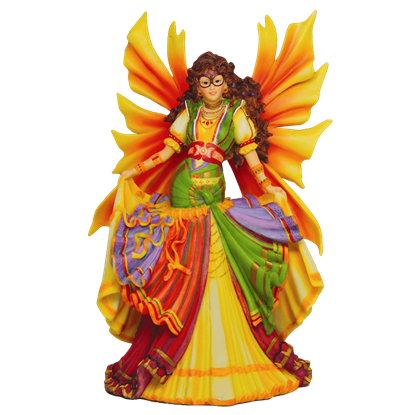 Her costume of choice is that of the gypsy, and thanks to her stunning dress and natural grace, it is a look that comes easy to this Colorful Gypsy Dancer Faery Statue. There is no denying that gypsies have a taste for the more flamboyant things in life, including bright colors. 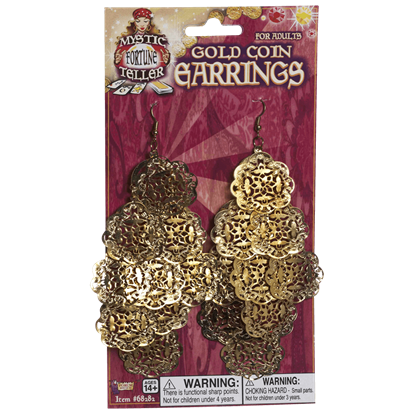 Gold, especially, is something all gypsies seem to love, and these Dangling Flower Gypsy Earrings feature it in abundance. 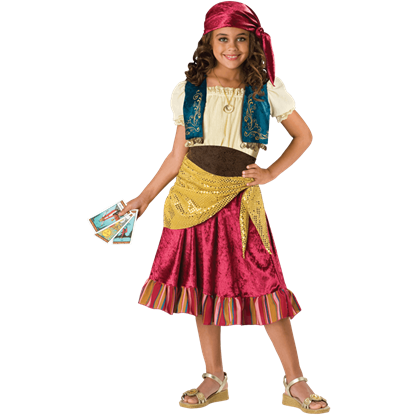 The Fortune Teller Girl's Costume is great for a spirited, maybe even sassy young girl who loves color and does not like to be told what to do, making her a free spirit in the truest sense of the word. The Fortune Teller Women's Costume is a great costume that incorporates not only a vivid array of color but also a touch of exotic, yet mystical attitude that separates the average fortune teller from the truly great. Who does fortune really favor? The bold? The lucky? The real answer is that fortune favors whoever it wants, and in this Good Fortune Womens Costume, the same applies to you, as you will look as beautiful as Lady Luck herself. Typical gypsy jewelry always seems to have a twist of some kind, and it always seems to musically jingle. 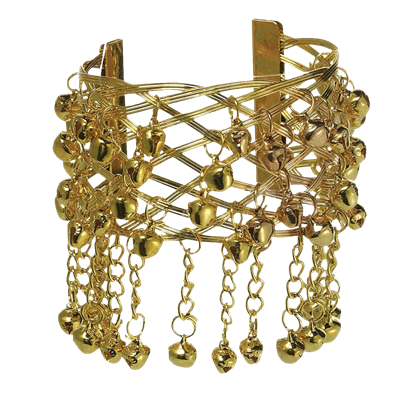 This Gypsy Bell Bracelet does not disappoint in that regard, featuring a gilded look that is covered with dozens of little bells. 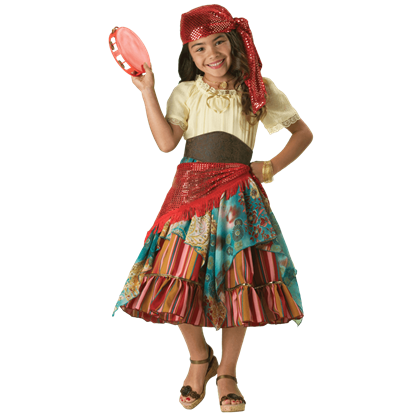 The Gypsy Girl's Costume is great for a spirited, maybe even sassy young girl who loves color and does not like to be told what to do, especially if she is a free spirit in the truest sense of the word. Join the Halloween festivities this year by immersing yourself in the role of a fortuneteller. 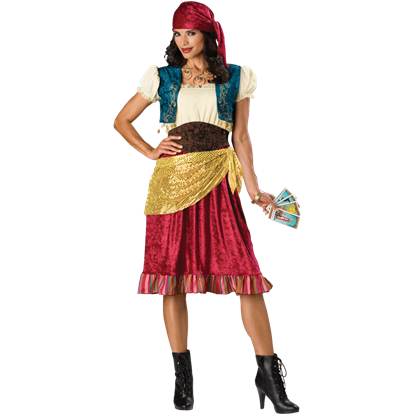 A glimpse into a crystal ball is not necessary to see that your appearance at the party will be a success with the Gypsy Rose Costume. Gypsies are typically a free and spirited people, and the Gypsy Women's Costume captures that mentality and image perfectly, blending wild colors and comfortable garments into a masterful womens costume suitable for many occasions. Now you can simultaneously add a touch of mysticism and glittering gold to your preferred costume with this Gypsys Coined Head Scarf. The combination of sheer fabric and dangling gold coins is one that not many will soon forget. Our Medieval Gathered Skirts are made of soft cotton that mimics the weave of linen without the expense. Lacing in the back of the waistband allows you to adjust the fit. 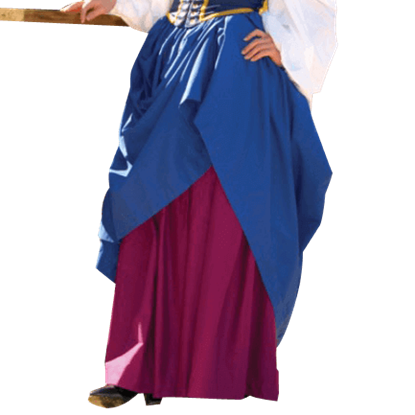 This is a perfect wench, medieval or Renaissance skirt.